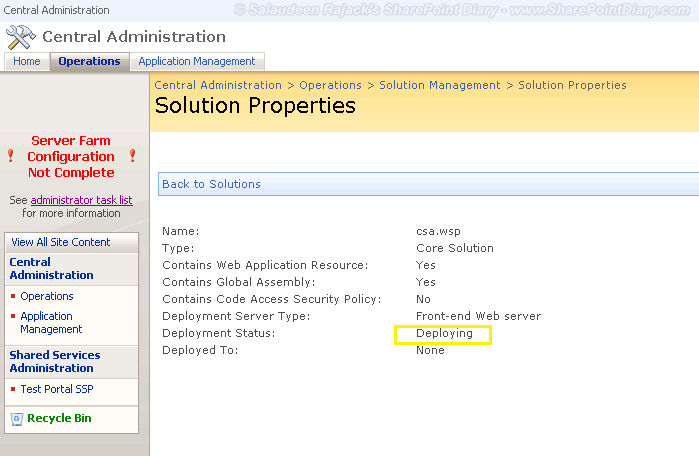 Home Deployment Guides SharePoint SharePoint 2007 SharePoint 2010 SharePoint 2013 SharePoint WSP Solution Deployment Stuck at "Deploying"
SharePoint WSP Solution Deployment Stuck at "Deploying"
Issue: SharePoint WSP Solution got stuck at "Deploying" stage for hours while trying to deploy using STSADM command in SharePoint 2007! Try these workarounds to fix the solution deployment stuck at "deploying" stage. Make sure all your WFE & DB Servers in the Farm has no Time zone different! Make them aligned! Try running: stsadm -o execadmsvcjobs as the first step! stsadm -o canceldeployment -id "95823b2b-8c92-4d08-99d5-7cf14c7be602"
Try deploying for a single web application rather all. In "services on server", make sure "Microsoft SharePoint Foundation Workflow Timer Service" is running. If not, start it! Check "SharePoint Administration Service" in services console. If stopped, start it. If any one of your SharePoint Web front end server (where SharePoint web application is running) is turned-off, You may get into this issue. Either turn it ON or remove the server from the SharePoint server farm. As the last: Reboot the server! If nothing helps, have a look at the SharePoint logs/Event Log to check root cause.